Driving Guide Tours respects your privacy and is committed to protecting your personal data. This Policy will inform you as to how we look after your personal data when you visit our Site (regardless of where you visit it from) and tell you about your privacy rights and how the law protects you. This Policy aims to give you information on how Driving Guide Tours collects and processes your personal data through your use of this Site, including any data you may provide through this Sitewhen you sign up to our newsletter, send us a service request or reach us to get any information related to our business etc. This Site may include links to third-party websites, plug-ins and applications. Clicking on those links or enabling those connections may allow third parties to collect or share data about you. We do not control these third-party websites and are not responsible for their privacy statements. When you leave our Site, we encourage you to read the Policy of every website you visit. • Usage Data includes information about how you use our Site, products and services. • Automated technologies or interactions. As you interact with our Site, we may automatically collect Technical Data about your equipment, browsing actions and patterns. We collect this personal data by using cookies, server logs and other similar technologies. We may also receive Technical Data about you if you visit other websites employing our cookies. (b) search information providers such Google based outside the EU. • Identity, Contact, Financial and Transaction Data from tour agencies, tour operators or other third party you use to get our services provided. You will receive marketing communications from us if you have requested information from us or purchased services from us or if you provided us with your details when you registered for a promotion and, in each case, you have opted in of receiving that marketing. We will get your express opt-in consent before we share your personal data with any company outside the Driving Guide Tours for marketing purposes. • Third parties to whom we may choose to sell, transfer, or merge parts of our business or our assets. Alternatively, we may seek to acquire other businesses or merge with them. If a change happens to our business, then the new owners may use your personal data in the same way as set out in this Policy. Driving Guide Tours is based in Italy, which is where your data will be processed. Driving Guide Tours will use commercially reasonable efforts to comply with the General Data Protection Regulation (the “GDPR”), effective May 25, 2018, which applies to residents of the EEA.This Section 9 contains additional provisions that apply to you if you are a resident of the EEA. All other sections of the Policy are applicable to you. Driving Guide Tours is the Controller (as defined in the GDPR) and responsible for your personal data. If you have any questions about this Policy, including any requests to exercise your legal rights, please contact us using the details set out above. Request restriction of processing of your personal data. This enables you to ask us to suspend the processing of your personal data in the following scenarios: (a) if you want us to establish the data‘s accuracy; (b) where our use of the data is unlawful but you do not want us to erase it; (c) where you need us to hold the data even if we no longer require it as you need it to establish, exercise or defend legal claims; or (d) you have objected to our use of your data but we need to verify whether we have overriding legitimate grounds to use it. We try to respond to all legitimate requests within one month. Occasionally it may take us longer than a month if your request is particularly complex or you have made a number of requests. In thiscase, we will notify you and keep you updated. 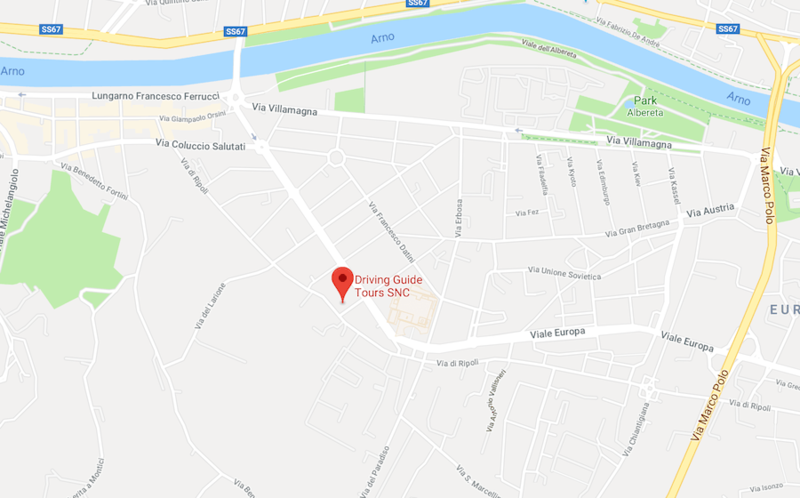 Specialists hired by Driving Guide Tours acting as joint controllers or processors and who are based in Italy and provide administrative, IT and system administration services. • Service providers acting as processors based in Italy who act as sub-contractors for Driving Guide Tours. • Service providers acting as processors based in Italy and the Russian Federation who provide IT services. • Professional advisers acting as processors or joint controllers including lawyers, bankers, auditors and insurers based in Italy who provide consultancy, banking, legal, insurance and accounting services.